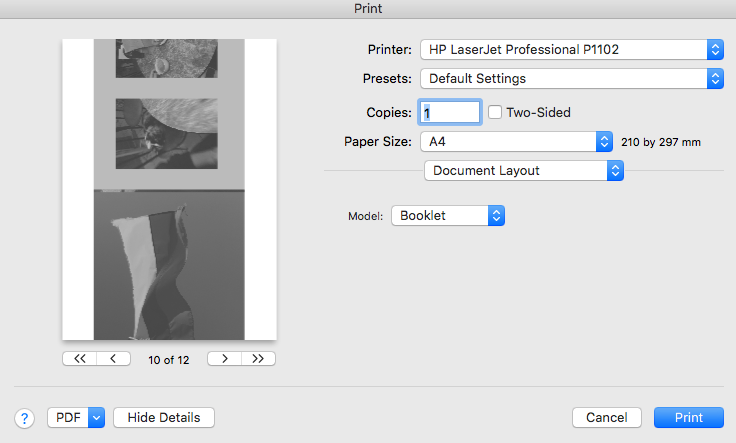 I would love to have a print booklet and/or export booklet option. As I too am interested in this feature, I will be glad to know your thoughts. And does anyone know the difference in "Book" versus "Booklet" in that setting? For me on Mac it doesn't seem to work properly. And in honesty, I rarely print straight from my computer it would be good to be able to export it. On Mac I can make a pdf, on win on the other hand idk. I got it to work for our needs, but you do have to put the paper size to match the sheets you are printing on, and make sure the scaling is set correctly (probaby 100% in most scenarios). I have always found ID booklet very difficult to use and inaccurate especially when trying to print A5 double spreads on A4 paper (A5 is 0.5mm different from A4 folded in half) so I use Create Booklet. I have just tested AP in Create Booklet exporting as PDF (pages) and it works just fine. I don't have any connection to the company at all, but I do recommend this app, it is an absolute must have for me. So even if AP doesn't have a good booklet function, you will always be able to get perfect booklet layout and margin control using Create Booklet. Ah, thank you! Missed that when I was looking through the options. It doesn't seem to have as many options, but for my needs that works way better than InDesign's booklet tool! Why oh why is it so darned difficult to print a booklet, I would love to see a tutorial on this. Surely technology can achieve this task !! I have tried and tried to print a 4 page A5 booklet so it prints on A4 paper and correctly organises the pages to be able to stack and fold in half in Affinity Publisher and it just won't work. In both cases, the view looks fine, but prints wrong. What am I doing wrong? Am I supposed to set up an A4 landscape document and put a center margin and design the two A5 sides manually? I know how you feel, I have been struggling with this for ages. Surely there is a way within the program to do exactly what we require. It is a basic requirement, whether it be a 4 page or 16 page book;et or whatever number of pages, it should be an automatic function to achieve this. I hope the developers are paying attention to this. Have you got facing pages on? The print settings Garrettm30 recommended work just fine for me. Design with a page size of A5 and facing pages on, so you have a spread for page one, a spread for pages two-three, and a spread for page four. 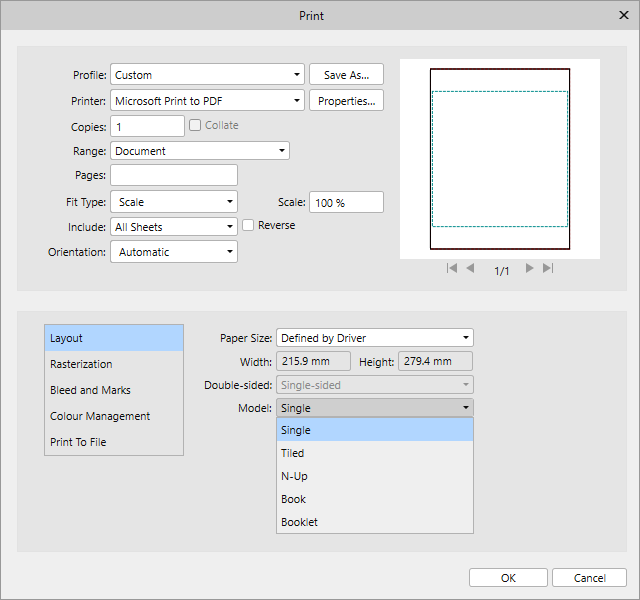 Use the print settings to select an A4 paper size and a booklet layout, and Affinity should rearrange your pages to print with one and four on one side and two-three on the other. Hi, yes. Done all of that. It was already set up as facing pages. Set everything up exactly as it should be and tried dabbling with every other setting too. Double sided printing just isn’t working, and no matter what setting I change, it prints my entire spread on one side of Paper, like thumbnails. I’ve tried every scale setting, every paper size, all the modes and double sided options. It prints it the same. When I export my pages as a pdf and print the booklet from Adobe acrobat, it prints perfectly, so the fault is with Affinity Publisher and it’s communication with my printer I think. Huh. How strange. In fairness, I’ve not actually tried sending it directly to the printer. 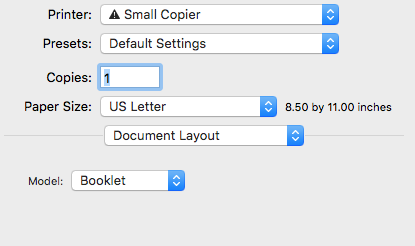 I’m just using the Print dialog to generate PDFs with the pages arranged for booklet printing. Does that work for you? Managed it at long last. Have just printed out an 8 page booklet. Start New Document, size A5, facing pages. Make 8 pages (see screenshot). Go to Print - Set doc page size as A4 - double sided - flip on short side. Click on print and out came 2 sheets of Af landscape, printed double sided with the pages in correct order ! Forgot to mention, dont chage your printer setup other than print quality and similar, just print with A Pub settings. Glad that’s worked for you. That’s exactly what I’ve done, but still no joy. I might leave my printer and pc details in the bug section, because it might be something to do with that. I can’t understand why else it’s not working when I’ve done exactly the same as this (not messed with my printer settings either, just as you have, used Afpub print dialogue. If I print to PDF using the facing pages spread, it generates a PDF with the facing pages on one page together. So when you print the PDF, you get two of your pages scaled down to fit side by side on one page, which is no good either! edit: what I mean is, it won’t print it as a booklet, it prints your first page large, next two scaled down side by side. I just think I’ll export my spread as PDF pages and then use Adobe Acrobats print dialogue. Just a thought, have you downloaded the latest beta ?